FAO Director-General Jose Graziano da Silva and Bolivian President Evo Morales at FAO HQ in Rome. 29 June 2018, Rome - FAO is assisting Bolivia in its effort to access financial support for improved resilience of agriculture to climate change in the Yapacaní river basin. 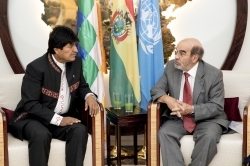 In a meeting held today, FAO Director-General José Graziano da Silva and Bolivian President Evo Morales discussed the development of a technical proposal to be submitted to the UN’s Green Climate Fund requesting 50 million dollars to deal with the effects of climate change. President Morales thanked Graziano da Silva and the FAO team for their "vision to guarantee food for the peoples of the world." "It is an honor to visit him to share successful experiences and to thank him for all the support he gives Bolivia to obtain funding for water projects and agricultural production," he said. The Green Climate fund is an international funding mechanism established at the 2010 UN Climate Conference that aims to support developing country efforts to adapt to and mitigate the impacts of climate change. Countries can receive stand-alone grants for simpler projects like well or cistern construction, or loans for more complex projects like the large-scale irrigation systems, either directly from the fund or via accredited implementing agencies, such as FAO.